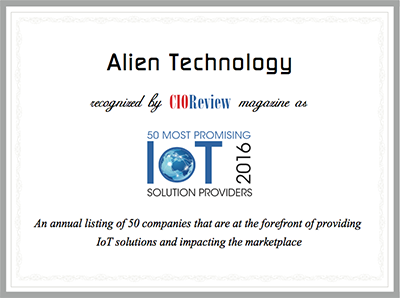 Alien Technology named to Connected World Magazine’s 2012 CW 100 Recognizing The Most Innovative Connected-Device Technology Companies. Alien Technology Asia has been selected by RFID Journal Korea as the RFID Company of the Year. Alien Technology was selected as a winner of the 2007 “Red Herring 100 Global” Award. Red Herring Magazine, a leading voice for technology innovation and venture financing in the high tech world, selected Alien as a Top 100 Winner for 2007. The JourNal Report: Innovation Awards Alien Technology wins Wall Street Journal Global Innovation Award. Alien Technology’s RFID Solution Center has been awarded the EPCglobal Test Center Program (v.2.0) Accreditation Certificate for compliance with EPC Global Inc. performance test center specifications for certified services and core technical capabilities. Alien Technology is EPCglobal certified. The certification mark signifies that hardware products have been tested and should operate according to EPCglobal Inc Standards, such as the UHF Generation 2 Air Interface Protocol standard ratified in December 2004.